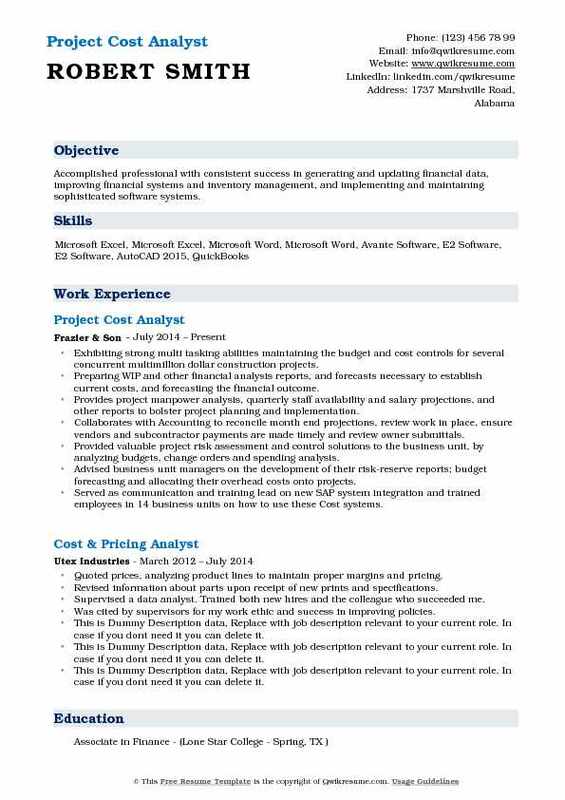 The Cost Analyst is the support person for a business rendering a powerful backup to the financial team. The responsibilities of a Cost Analyst is to effectively manage and control the business, control cost, check general accounting, cost accounting, conduct material audits, reconcile inventory and draft Cost analysis for the firm. 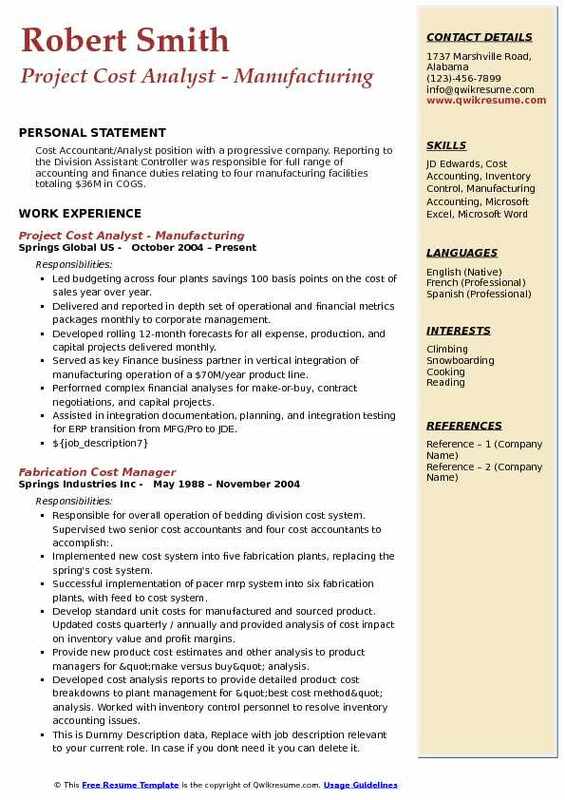 The Cost Analyst should work closely with the manufacturing sector, understand the issues and inform the department about its impacts and cost diverse or variances. Above all, it is the prime duty of a Cost Analyst to become a liaison with the corporate financial staff whenever required. Normally for filling this Crucial post a Bachelors degree in Commerce, Finance or Administration is required, but individuals pursuing CA and ICWA are highly preferred for this post. 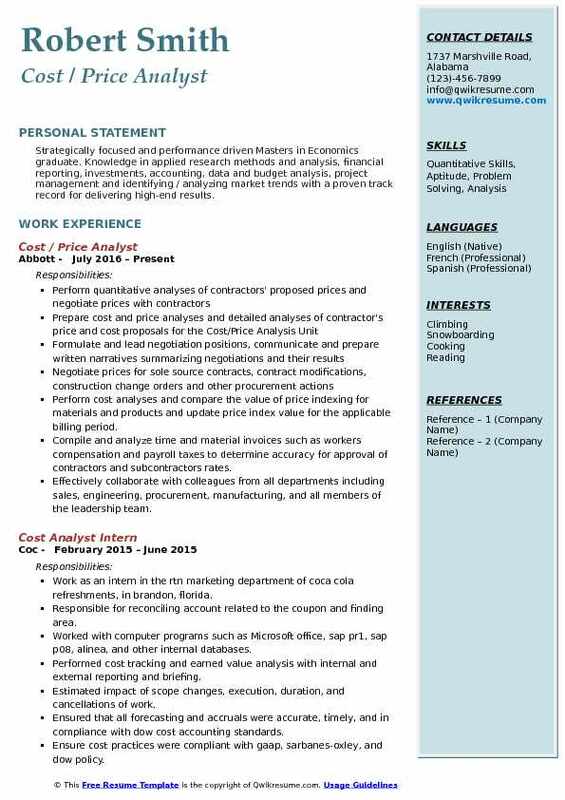 A well-crafted Cost Analyst Resume Sample that contains ample experience as Cost accountant will enable an individual to get a direct Cost Analyst post in reputed companies. 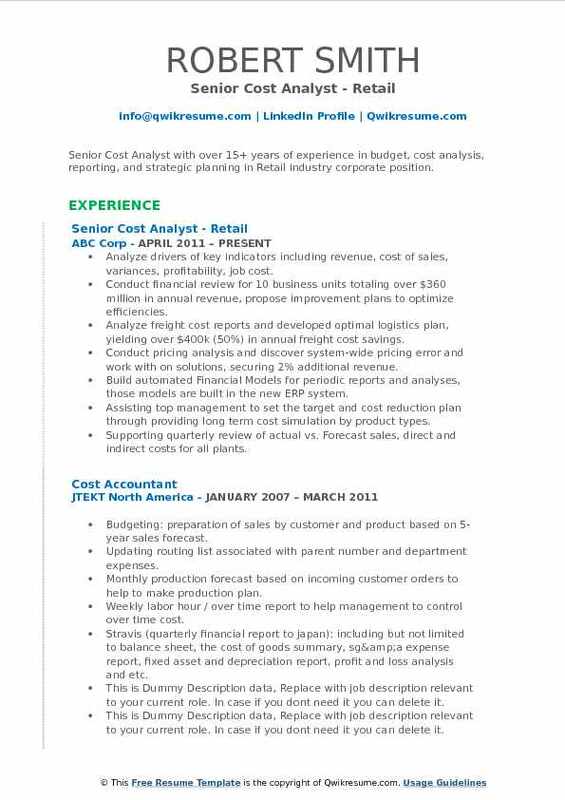 Summary : Over 23 years of experience in Automotive and global dairy enterprise. Effectively leads and participates in high performing teams focused on sustainable financial performance improvements. Overall responsibility for the analysis of all financial models for two business units while emphasizing cost reduction in both variable and fixed costs. Completes all journal entries, analysis and presents variance explanations to plant operations and directors on a periodic basis. Audits and maintains accurate costs on a periodic basis and effectively communicate all product cost changes. Designed systems, processes, and procedures that collect and record data required for internal and external reporting. Analyze and Execute fiscal year standard improvement plan to reduce variable and fixed costs which resulted in total plant reduction of over $3.2m during a six year period. Created category lead dashboard comparing multiple operations on key metrics of labor and material costs including results against predetermined goals. Created a company-wide dashboard providing data which highlight opportunity dollars lost by item and category type and increasing efficiency of inventory use by 30%. Summary : Advanced Fortune 500 experience managing development and reporting of program and project cost in engineering environments; corporate financial management and reporting; value management. Support new programs and projects reporting, analysis, and business plan activities by developing program component cost and its structure as well as supplier tooling budgets, forecasts, and variance analysis by part and system level. Manage cost and investment reporting development with feasibility briefings including engineering, cost estimation, program management, and vehicle cost engineering. Enhanced Excel integrated lookup data management methods; revision control with embedded notes, revision tab, SharePoint site establishment for access control. Presentation to management financial roll up of cost, investment, risks, opportunities, contingencies. Variance analysis development explaining cost drivers between development cycles. Analysis exercising judgment utilizing various templates, macros, lookups across diverse data sources. Manage changes in component cost and investment working with change management process. 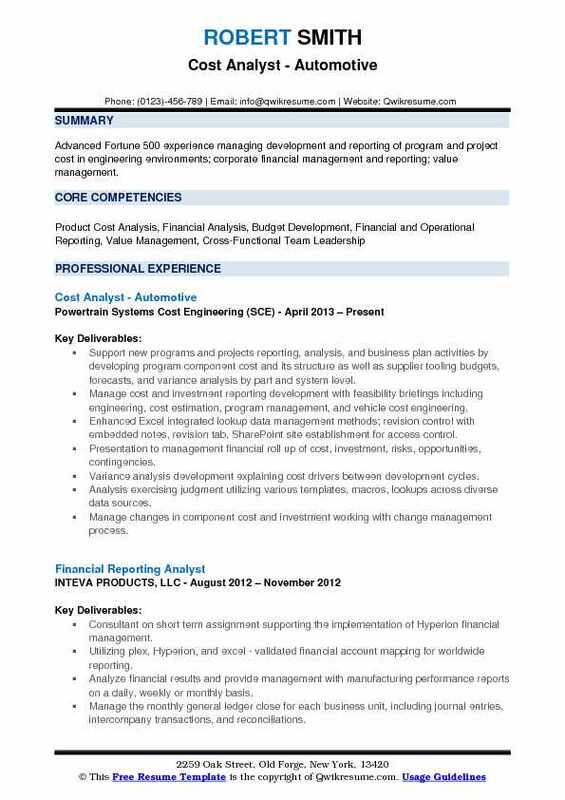 Summary : Innovative Finance Professional with broad experience in all aspects of cost accounting, cost analysis, data management, and process improvement. Proficient at calculating components of standard cost, including duty and freight expenses for manufactured consumer goods. Evaluated current cost and analyzed quarterly cost changes, reporting variances and drivers to the executive management. Managed and coordinated large data uploads to SAP for maintenance of standard cost for finished goods and service parts. Reduced number of price blocked invoices 91% thru implementation of process improvements and quality controls. Provided guidance to purchasing managers in price negotiations ensuring compliance with Sarbanes-Oxley regulations. Surpassed annual goal of 90% for timely processing of month-end vouchers to GL. Cross trained supply chain planners and purchasing managers on price updates in SAP, ensuring current cost maintenance was performed in a timely fashion. Updated SAP with large data sets from annual cost rolls and conducted audit reviews impacting 12k active SKUs that resulted in a seamless transition of cost changes for year-to-year business transactions. 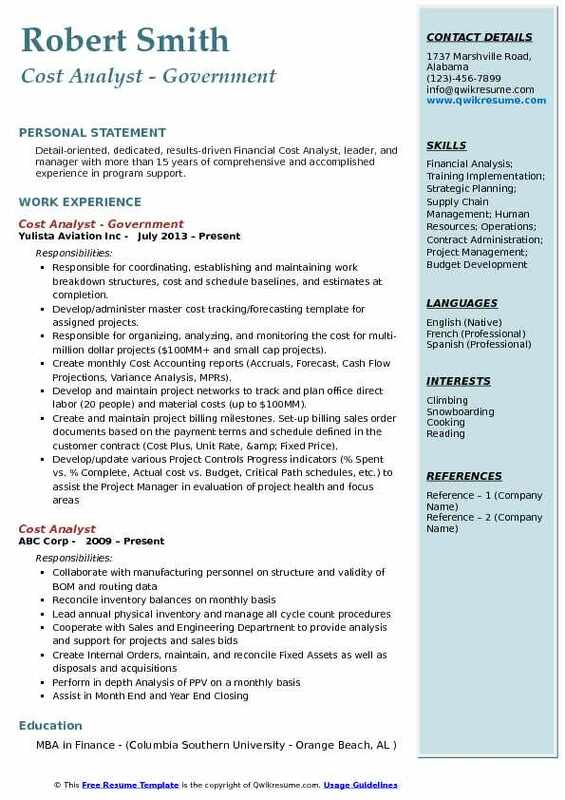 Summary : Senior Cost Analyst with over 15+ years of experience in budget, cost analysis, reporting, and strategic planning in Retail industry corporate position. Analyze drivers of key indicators including revenue, cost of sales, variances, profitability, job cost. Conduct financial review for 10 business units totaling over $360 million in annual revenue, propose improvement plans to optimize efficiencies. Analyze freight cost reports and developed optimal logistics plan, yielding over $400k (50%) in annual freight cost savings. Conduct pricing analysis and discover system-wide pricing error and work with on solutions, securing 2% additional revenue. Build automated Financial Models for periodic reports and analyses, those models are built in the new ERP system. Assisting top management to set the target and cost reduction plan through providing long term cost simulation by product types. Supporting quarterly review of actual vs. Forecast sales, direct and indirect costs for all plants. Summary : Detail-oriented, dedicated, results-driven Financial Cost Analyst, leader, and manager with more than 15 years of comprehensive and accomplished experience in program support. Responsible for coordinating, establishing and maintaining work breakdown structures, cost and schedule baselines, and estimates at completion. Develop/administer master cost tracking/forecasting template for assigned projects. 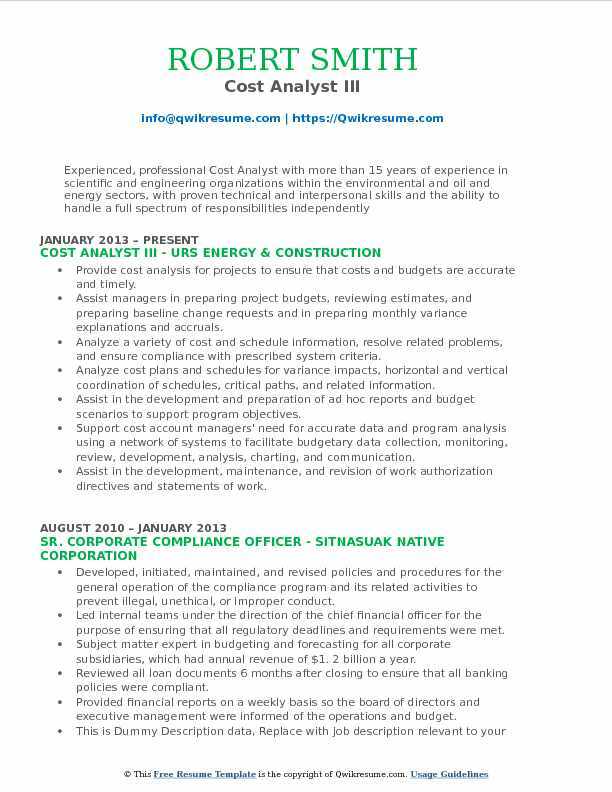 Responsible for organizing, analyzing, and monitoring the cost for multi-million dollar projects ($100MM+ and small cap projects). Create monthly Cost Accounting reports (Accruals, Forecast, Cash Flow Projections, Variance Analysis, MPRs). Develop and maintain project networks to track and plan office direct labor (20 people) and material costs (up to $100MM). Create and maintain project billing milestones. Set-up billing sales order documents based on the payment terms and schedule defined in the customer contract (Cost Plus, Unit Rate, & Fixed Price). Headline : Accomplished professional with consistent success in generating and updating financial data, improving financial systems and inventory management, and implementing and maintaining sophisticated software systems. Exhibiting strong multi tasking abilities maintaining the budget and cost controls for several concurrent multimillion dollar construction projects. Preparing WIP and other financial analysis reports, and forecasts necessary to establish current costs, and forecasting the financial outcome. 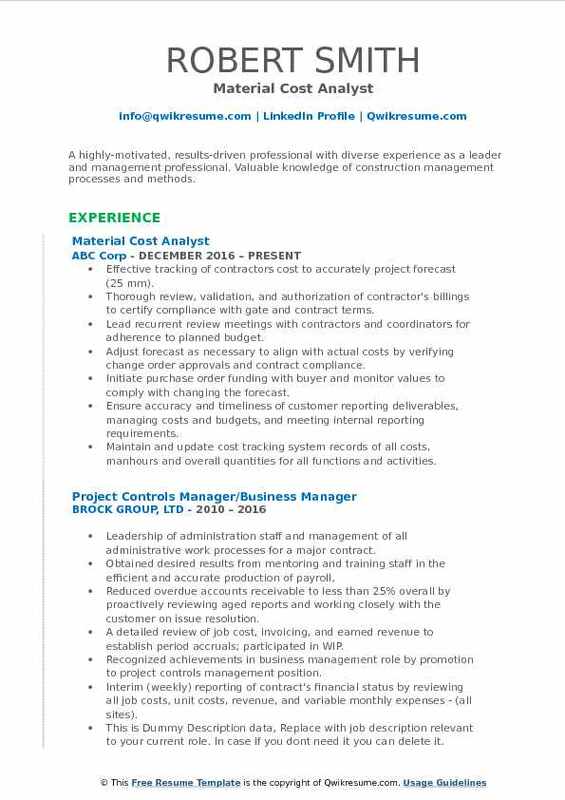 Provides project manpower analysis, quarterly staff availability and salary projections, and other reports to bolster project planning and implementation. Collaborates with Accounting to reconcile month end projections, review work in place, ensure vendors and subcontractor payments are made timely and review owner submittals. Provided valuable project risk assessment and control solutions to the business unit, by analyzing budgets, change orders and spending analysis. Advised business unit managers on the development of their risk-reserve reports; budget forecasting and allocating their overhead costs onto projects. Served as communication and training lead on new SAP system integration and trained employees in 14 business units on how to use these Cost systems. Provide cost analysis for projects to ensure that costs and budgets are accurate and timely. Assist managers in preparing project budgets, reviewing estimates, and preparing baseline change requests and in preparing monthly variance explanations and accruals. Analyze a variety of cost and schedule information, resolve related problems, and ensure compliance with prescribed system criteria. Analyze cost plans and schedules for variance impacts, horizontal and vertical coordination of schedules, critical paths, and related information. Assist in the development and preparation of ad hoc reports and budget scenarios to support program objectives. Support cost account managers' need for accurate data and program analysis using a network of systems to facilitate budgetary data collection, monitoring, review, development, analysis, charting, and communication. Assist in the development, maintenance, and revision of work authorization directives and statements of work. 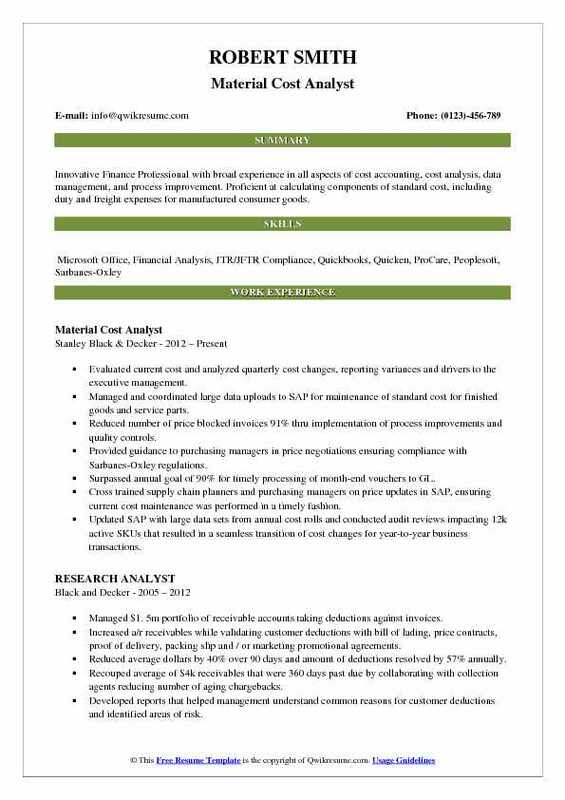 Headline : An innovative results-driven, self-starter, dedicated to excellence and efficiency with over 15 years of progressive experience as a Financial & Cost Analyst. Excellent organization and communication skills, ensuring streamlined processes and workflow. Analyze monthly projects budgeting and reports to maintain expenditure controls. Compile and analyze accounting records and other data to determine the financial resources required to implement a new task or compliance operation. Perform cost-benefits analyses to compare operating programs, review financial request, and explore alternative financing methods. Summarize budgets and submit recommendations for the approval or disapproval of funds request. Prepare the annual, quarterly and monthly projections or manufacturing budget plan (material, labor & overhead) and share service budgets. 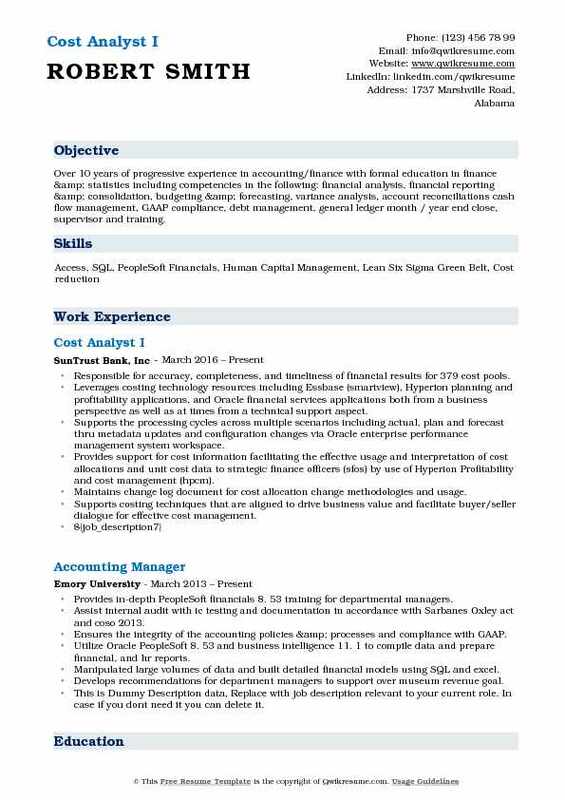 Summary : Cost Accountant/Analyst position with a progressive company. Reporting to the Division Assistant Controller was responsible for full range of accounting and finance duties relating to four manufacturing facilities totaling $36M in COGS. Led budgeting across four plants savings 100 basis points on the cost of sales year over year. Delivered and reported in depth set of operational and financial metrics packages monthly to corporate management. Developed rolling 12-month forecasts for all expense, production, and capital projects delivered monthly. Served as key Finance business partner in vertical integration of manufacturing operation of a $70M/year product line. Performed complex financial analyses for make-or-buy, contract negotiations, and capital projects. Assisted in integration documentation, planning, and integration testing for ERP transition from MFG/Pro to JDE. 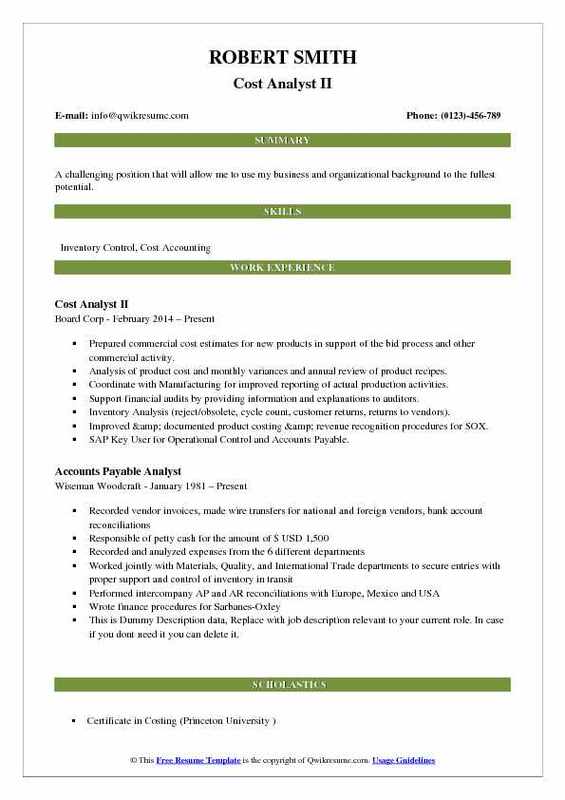 Summary : Over 15 years experience in cost accounting with dynamic high-tech start-ups and multinational corporations. Good knowledge of various ERP systems; an often go-to person for users. Major contributor to the planning and design of Oracle ERP in the cost and inventory areas, with a significant role in subsequent testing, implementation, and enhancement. Worked with and supported operations to ensure data integrity of inventory reporting as the business expanded to multiple warehouses and use of 3PL. Extensive work in establishing evaluation inventory dashboard by region and product line and trend for sales and BU. Month end responsibilities, including book-to-perpetual inventory reconciliation, margin, PPV and period expense analysis, inventory trend and E&O analysis. Interacted with the material, purchasing, operations, business system and sales op in day-to-day activities regarding po, bom, inventory, cost standard, npi, reverse logistics and order fulfillment. Covered fixed asset and sales order auditing, and other projects as required. Summary : Experience in financial analysis, forecasting, budgets, costs, variance analysis, and overhead rates. Produces accurate and timely financial statements. Managed, monitored and reported over fifty government and commercial contracts totaling $25 million in revenue. Developed monthly/yearly budgets, forecasts, and expenditures for $17 million annual revenue. Performed account reconciliations, overhead rate calculations, variance analysis. Performed variance analysis of Cost to Budget, etc, EAC, and GM on all DOD and commercial contracts. Prepared all invoices and various customer financial reports. Ffp, cpff, t&m, milestone payments, cfsr etc. Gathered and input all program data into the government "ice model" for overhead rates. 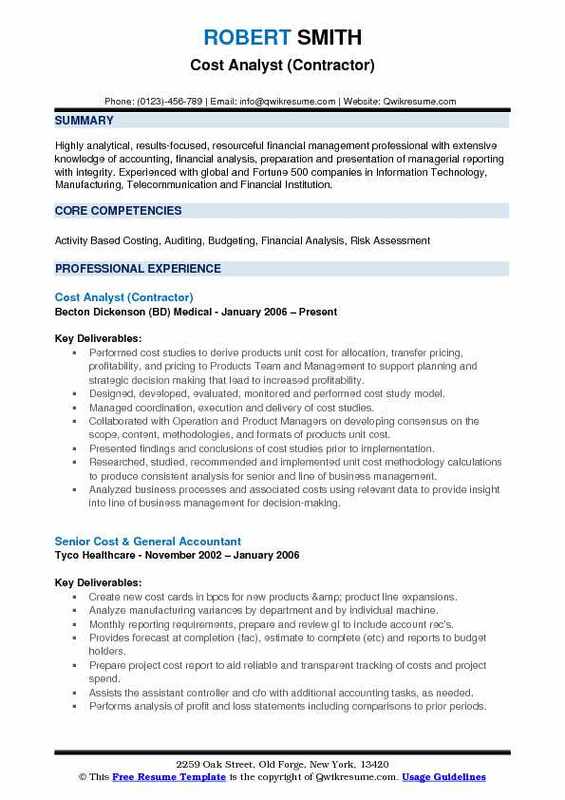 Core team member for costpoint erp implementation, sales, programs, invoices, and expenses. 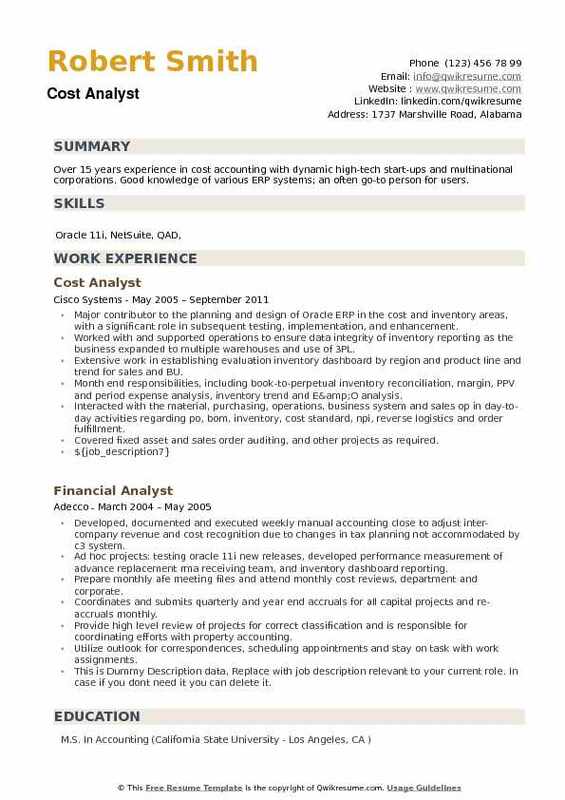 Summary : Highly analytical, results-focused, resourceful financial management professional with extensive knowledge of accounting, financial analysis, preparation and presentation of managerial reporting with integrity. 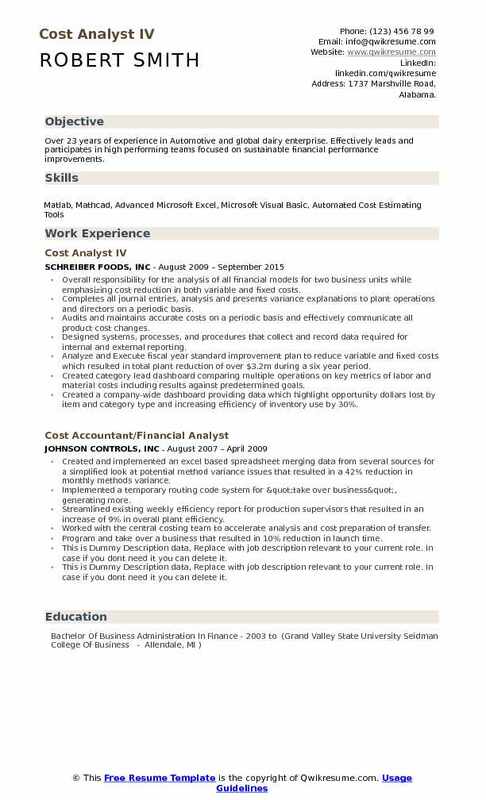 Experienced with global and Fortune 500 companies in Information Technology, Manufacturing, Telecommunication and Financial Institution. Performed cost studies to derive products unit cost for allocation, transfer pricing, profitability, and pricing to Products Team and Management to support planning and strategic decision making that lead to increased profitability. Designed, developed, evaluated, monitored and performed cost study model. Managed coordination, execution and delivery of cost studies. Collaborated with Operation and Product Managers on developing consensus on the scope, content, methodologies, and formats of products unit cost. Presented findings and conclusions of cost studies prior to implementation. Researched, studied, recommended and implemented unit cost methodology calculations to produce consistent analysis for senior and line of business management. Analyzed business processes and associated costs using relevant data to provide insight into line of business management for decision-making. 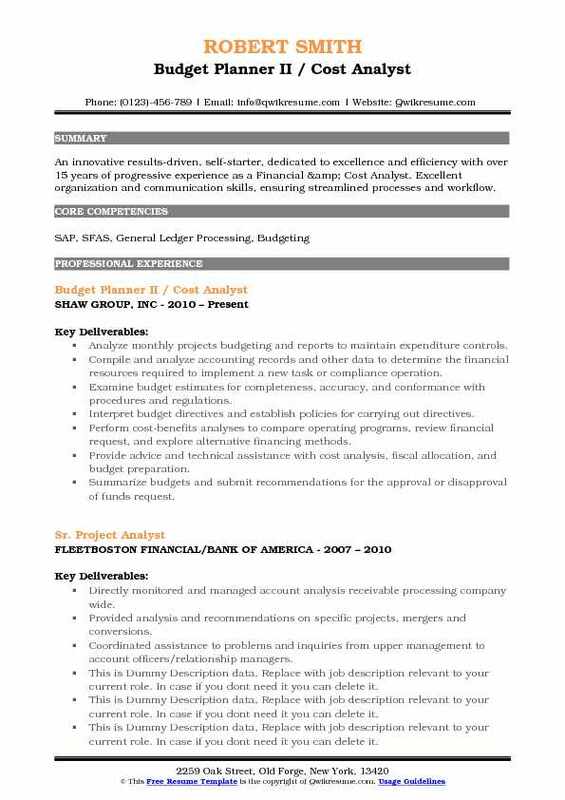 Summary : A challenging position that will allow me to use my business and organizational background to the fullest potential. Prepared commercial cost estimates for new products in support of the bid process and other commercial activity. Analysis of product cost and monthly variances and annual review of product recipes. Coordinate with Manufacturing for improved reporting of actual production activities. Support financial audits by providing information and explanations to auditors. Inventory Analysis (reject/obsolete, cycle count, customer returns, returns to vendors). Improved & documented product costing & revenue recognition procedures for SOX. 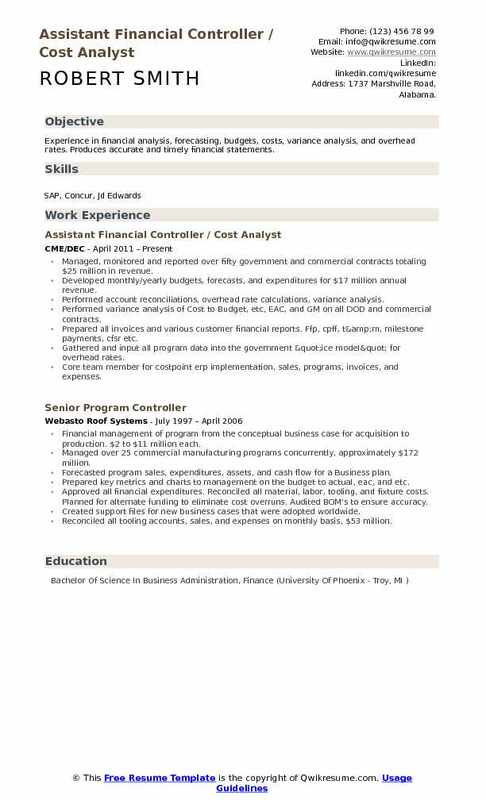 SAP Key User for Operational Control and Accounts Payable. Summary : A highly-motivated, results-driven professional with diverse experience as a leader and management professional. Valuable knowledge of construction management processes and methods. Effective tracking of contractors cost to accurately project forecast (25 mm). Thorough review, validation, and authorization of contractor's billings to certify compliance with gate and contract terms. Lead recurrent review meetings with contractors and coordinators for adherence to planned budget. Adjust forecast as necessary to align with actual costs by verifying change order approvals and contract compliance. Initiate purchase order funding with buyer and monitor values to comply with changing the forecast. Ensure accuracy and timeliness of customer reporting deliverables, managing costs and budgets, and meeting internal reporting requirements. Maintain and update cost tracking system records of all costs, manhours and overall quantities for all functions and activities. Objective : Strategically focused and performance driven Masters in Economics graduate. Knowledge in applied research methods and analysis, financial reporting, investments, accounting, data and budget analysis, project management and identifying / analyzing market trends with a proven track record for delivering high-end results. Perform cost analyses and compare the value of price indexing for materials and products and update price index value for the applicable billing period. Compile and analyze time and material invoices such as workers compensation and payroll taxes to determine accuracy for approval of contractors and subcontractors rates. Effectively collaborate with colleagues from all departments including sales, engineering, procurement, manufacturing, and all members of the leadership team. Summary : Over 10 years of progressive experience in accounting/finance with formal education in finance & statistics including competencies in the following: financial analysis, financial reporting & consolidation, budgeting & forecasting, variance analysis, account reconciliations cash flow management, GAAP compliance, debt management, general ledger month / year end close, supervisor and training. Responsible for accuracy, completeness, and timeliness of financial results for 379 cost pools. Leverages costing technology resources including Essbase (smartview), Hyperion planning and profitability applications, and Oracle financial services applications both from a business perspective as well as at times from a technical support aspect. Supports the processing cycles across multiple scenarios including actual, plan and forecast thru metadata updates and configuration changes via Oracle enterprise performance management system workspace. Provides support for cost information facilitating the effective usage and interpretation of cost allocations and unit cost data to strategic finance officers (sfos) by use of Hyperion Profitability and cost management (hpcm). Maintains change log document for cost allocation change methodologies and usage. Supports costing techniques that are aligned to drive business value and facilitate buyer/seller dialogue for effective cost management.